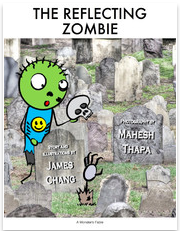 It's a book about zombies. Not medically related... unless braaaiiinnnsss counts! Available for free on the iPad, it's The Reflecting Zombie. Possibly the world's shortest how-to-get-into-medical-school book you will ever read! It's free for the iPad! 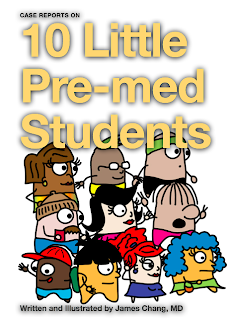 10 Little Pre-Med Students. Oh Doctor, The Places You'll Go... is composed of 13 illustrations drawn completely on my iPad 2 using the app, Sketchbook pro and a stylus. 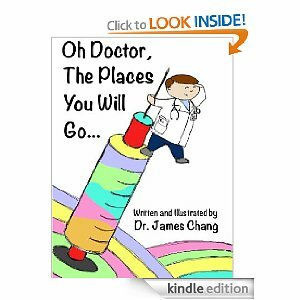 Inspired by Dr. Seuss, this book is my take on the long road of becoming a physician. Now there is a free iPad version too! The colorful illustrations are best viewed on a color device, however the pictures also translate well on E-ink screens.